Well, the day wasn't boring. Our local new station, Channel 6 (WPVI) called the weather on Sunday, August 2nd - Storm Struck. It was an apt phrase and completely summed up the day's weather. 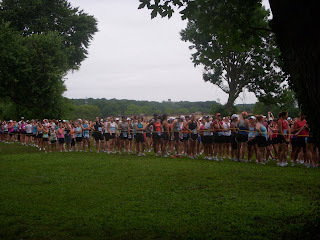 My 2nd triathlon in the 2009 Danskin SheRoxTri was a wet affair. 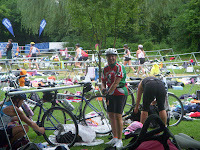 The highlights: The Triathlon went on and I survived the entire event in the rain. I had energy left over. Thousands of women participated in the rain. At least 7 of my friends came out to watch the event. I accomplished my goal of finishing the triathlon in about 2 hours time, down about a half-hour from my 2:27:58 finish last year. The low-lights: The swim portion was canceled due to thunder, lightening and unsafe river conditions. The race was delayed by at least 35 minutes. For more than an hour before the planned start, no one knew whether or not we would swim in the Schuylkill River. We didn't find out until 8:05 that the swim was cancelled. It rained a lot - constant drizzling and alternating hard rains capped off with a massive down pour at the end. The Triathlon became a Duo-athalon - Run 1.5 miles - Bike 15.5 miles - Run 3.1 miles. 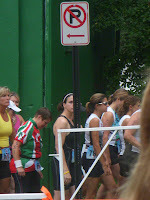 Even after the race started, the storms became so severe that the race officials had to cancel the finish - two and a half hours after the start; many women did not get to finish the bike course or their 5K run. Luckily, I crossed the finish line at about 2 hours and 29 minutes into the race - though I don't know my finish time since I don't know what time I actually started. The vendors, masseuses, food stands and prize awards ceremony were rained out and probably swept away by the flooding, down pours and mudslides. The road course conditions were terrible - humid and oppressive air for both runs, wet roads and tire spray-back on the bike course. Our backs and shirts, shoes and socks were completely skunked - that is, a line of dirt and mud up our backs and all around our legs and feet. I saw at least 6 bike wipe outs and two ambulances carting women away on stretchers. I witnessed one woman in a neck brace. Coming out of Fairmount Park there is a large downhill road leading to Strawberry Mansion Bridge. Bikers unfamiliar with this area or uncertain of their biking skills were falling and sliding, crashing into the sharp corners and curves. It's dangerous under normal conditions, add wet roads and oil coming up on the surface, nerves and adrenaline and you have extremely dangerous conditions. For me, this part wasn't so scary. I have ridden and trained for two seasons in hot, cold, dry, and wet conditions and I bike this course often. I was in my element on the bike portion. As a matter of fact, I feel given the weather conditions, I excelled at the bike ride. If the roads weren't wet, I think I would have done even better than I did. I'm guessing my time was about 1 hour on the bike. Without the rain and wet streets I might have clocked the bike portion in about 50 minutes. The most bizarre part about the bike course, heck even the whole race - it was eerily quiet. Last year I remember women were chatting a lot with each other. This year, we were silent, concentrating on staying upright and ahead of the impending downpour. Five minutes before I finished my second loop, the rains came again, filling my shoes with water and slowing the bike ride down considerably. As for the runs - the first run felt great. Running a mile and half was fairly easy. Making myself remember to save energy for the next two "legs" of the race proved trickier. I was very disappointed not to have been able to swim. Running 1.5 miles doesn't compare to swimming in the river, upstream for 1/4 of a mile and downstream for the next 1/4 mile. I would have liked to know how I would have fared in the swim portion. I trained for the swim, I learned how to swim more efficiently and I knew what I wanted to do once I got in the water to conquer my fears, find my rhythm and remember to breathe properly. The week leading up to the tri I was very nervous. 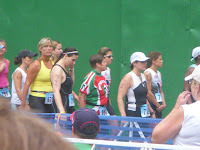 Since I knew I could do the triathlon and I knew I could finish, I was mostly nervous about how well I would perform. The night before and up until the start, I was still anxious. When we got word we wouldn't be swimming my relief was a mixed combination of feelings. Disappointed not to test my skills. Relieved that I wouldn't have to get in the over-flowing river. Worried that the tri was now somehow not as "legitimate" since it became a duo-athlon. Confident that I would do better than I did last year. By the end of the race, having to perform under such adverse weather conditions I realized that the 2009 and 2008 events could not be compared. They were so completely different and I am such a different athlete, in better shape physically and mentally. This tri was harder given the weather and all the rain. I had to run more and find and reserve my energy resources. I had to remind myself to take it easy while biking so I wouldn't become a casualty too. Plus I had to save some leg power for the final run. I still can't run a solid continuous 3.1 miles - I power-walk about 1/4 of a mile. However, I did my sprint to the finish, once again finding deep within myself some jet-power fuel to propel myself across that finish line just in the nick of time before the rains came and shut down the day. Rain is a powerful force that can hinder any and all athletes.